Rugged front loader with lifting and tipping mechanism. Features fully enclosed drive chain, fully working backhoe with footrest for children, detachable twin axle trailer with tipping action and swivel seat. Dimensions: 225L x 60W x 79H cm. Recommended age 3 years +. Only available in Republic of Ireland and Northern Ireland. Apologies for any inconvenience caused…. This toy costs approximately £149.99 (for the latest and best prices make sure you check our retailer list for the Power Loader Tractor, Loader, Backhoe and Trailer above). 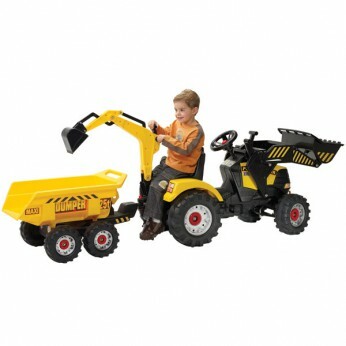 In our review of Power Loader Tractor, Loader, Backhoe and Trailer we classed it as being suitable for ages 3 years, 4 years, 5 years but recommend you check the manufacturer specific advice before purchasing.